These trends in Christianity prepared a fertile seed bed for monasticism. On the one hand, the level of the morality of the average Christian appeared to be sinking and the ardent, their consciences quickened by the high standards of the New Testament, were not content. On the other hand, Christians had long honoured and many of them had practised voluntary poverty, fasting, and celibacy. But why should it have been monasticism rather than other forms of asceticism which arose and flourished on this soil? It was in the third century and in Egypt that monasticism sprang up on the ground so prepared. Attempts have been made to find its source in Indian, Greek, pagan Egyptian, or Jewish roots, but none of these has been supported by conclusive proof. Indeed, from the outset Christian monasticism has differed markedly from any previous asceticism or religious community. It seems probable that the impulse which led to its emergence was predominantly and perhaps entirely from the Gospel. Origen, a native of Alexandria, gave an example of extreme asceticism in self-mutilation and in austerity in food, drink, sleep, and bodily comforts, and he had a profound influence upon many of his pupils who became prominent in the Church in Egypt. Ascetic Gnostics, Marcionites, and Montanists were found in Egypt and may have contributed to the later developments. Yet factors other than those of Christian provenance may have been responsible for the birth of monasticism in Egypt rather than in some other land. Mysticism and the contemplative life were in non-Christian circles in Egypt, including the Neoplatonism which had its origin there, and they may have stimulated that phase of the monastic life. It is possible that influences may have entered from India. Manichsism may have contributed, although probably, if at all, later. Political and economic disorders in Egypt in the third and fourth centuries may have bred a sense of insecurity which impelled many to seek escape from the world. It is conceivable that a desire to be rid of the growing burden of civic obligations contributed to the flight of some from ordinary society. Probably, too, monasteries arose in part from disgust with city life, with its dust, crowds, noise, and moral corruption. That motive certainly made a strong appeal to some in other lands when the monastic movement had spread to them. The geography and climate of Egypt favoured the life of the monk, whether solitary or in community. The fertile valley of the Nile was a ribbon flanked on either side by the desert, rain was infrequent, and the ascetic could live alone and with little shelter, with such slight food as he needed from villages near at hand or raised on his own little plot of ground. Before the third century was out, Christian hermits were beginning to be seen in Egypt. Some of these had fled to the desert to escape the Decian persecution and remained there after it was over. Others, probably more numerous, began living in solitude as ascetics near villages in huts built by themselves and there gave themselves to prayer and contemplation. The most famous of the early monks was Anthony. We know of him chiefly from a biography which is attributed to Athanasius, the great Bishop of Alexandria, noted for his part in the Arian controversy, and which by its early and wide circulation did much to stimulate the spread of the monastic life. The account which this biography gives of Anthony can be briefly summarized. Anthony was born, of Egyptian ancestry, probably not far from the year 250, of well-to-do Christian parents, and was reared in their faith. When he was about eighteen or twenty years of age his parents died, leaving him with the care of a younger sister. One day, while in church, he heard, in the reading of the Gospel, the command of Jesus to the rich young ruler: "If thou wilt be perfect, go and sell what thou hast and give to the poor, and thou shalt have treasure in heaven, and come, follow me." Going out from the church, he immediately gave his inherited acres to the villagers, sold his movable possessions, and distributed the proceeds among the poor, reserving only enough for the care of his sister. Later hearing in church the injunction of Jesus, "be not anxious for tomorrow," he turned over even this remaining fund to the poor and placed his sister in the care of a community of virgins. He took up his abode outside the village, working with his hands, spending part of the return for food and giving the rest to the poor, visiting the hermits of whom he had heard, and learning from one or another of them graciousness, love, kindness, endurance, meekness, freedom from anger, and the art of prayer. He fought temptation in many forms, ate and drank sparingly and only of bread, salt, and water once a day after sunset, often went without food for from two to four days, slept but little and then usually on the bare ground, and to harden his body would not anoint it with oil. Later he withdrew to a ruined fort on a mountain and there dwelt alone for nearly twenty years, seldom seen by any. His fame eventually attracted disciples who built themselves cells in the mountains and emulated him in the solitary life. With him they formed a kind of community. Demons and the Devil were very real to him and he had many a bout with them. During one of the persecutions early in the fourth century he went to Alexandria, ministering to those condemned for the faith to the mines and the prisons, and hoping for martyrdom for himself. After the persecution ceased, he increased his austerities — fasting, giving up bathing, and wearing a skin garment with the hair next to his flesh. He withdrew again to solitude. There many sought him out, some for spiritual counsel and others for the miraculous healing of their diseases. He was strongly opposed to the Arians, and, going to Alexandria, denounced their views. As his fame spread, the Emperor Constantine and two of the latter's sons wrote to him, asking and receiving his counsel. He is said to have died in 356 at the age of 105 years. Although without formal education, he possessed a vigorous mind and a retentive memory. He was humble, cheerful, with a radiant love for God and with sympathy and well-mannered courtesy for the individuals who came to him. Anthony represented two types of monasticism. One of these was that of hermit, the eremitical life, where each monk lived in solitude. The other was a modification of the way of the hermit, in which the monks had individual dwellings — a cell, a cave, a hut, or some other shelter — yet sufficiently near one another to make fellowship possible. They might even have over them a fellow-monk as a kind of director. Such a collection of monks was known as a laura. 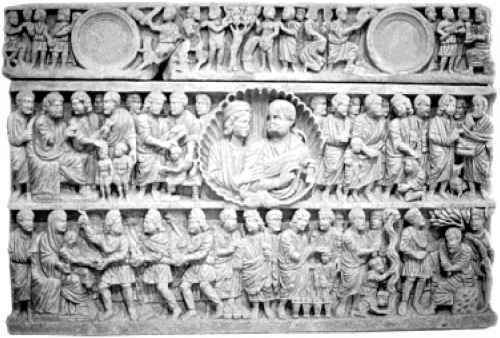 A third type of monasticism was the cenobitic, in which the monks lived in a community, or monastery, governed by a head monk and by rules. He who was looked back to as the great pioneer of that kind of life was Pachomius, a younger contemporary of Anthony, who was born c.285 or c.292 and who died in 346. The son of pagan parents in Egypt, at the age of twenty Pachomius was for a short time in the imperial army. There he was impressed with the thoughtful kindness of Christians in bringing food and drink to the soldiers, Leaving the army, he was given instruction in the faith, was baptized, and joined himself to an ascetic. Some time afterwards he began a monastery, and it became so popular that several others arose. Pachomius ruled over them from a central monastery. As he was dying he appointed a successor and the latter eventually chose a coadjutor who succeeded him in his office. Rules were gradually developed for the operation of the community. By the end of the fourth century the Pachomian system was fairly mature and stabilized. Each monastery was surrounded by a wall. Within this wall there were the houses in which the monks dwelt, twenty-two to forty to a house, and each with his own private cell. Every house had a common room for meetings. Within each enclosure there were also a church, a refectory, a library, a kitchen, a bakery, a store house for food, various workshops, and an infirmary. All the monasteries were under a superior-general or archimandrite who appointed his own successor. He visited them, made rules for them, and to each named one of the monks as resident head. In each house were placed, so far as possible, those with the same type of work. In every house the monks were ranked by order of seniority. Dress was prescribed and was very simple. All who applied were admitted if they were willing to keep the rules, but full membership was given only after a probation of three years. Each day had its regular times for group prayers by houses. The Eucharist was celebrated twice a week. Twice a year there were assemblies of all the monks, and at one of these the custom was for each to forgive any of the others who had done him an injury. Monks slept three in a cell and in a sitting, not a recumbent position. Study and memorization of passages from the Bible were required of all and the illiterate were taught to read. Manual labour was also compulsory, partly in the weaving of rushes into mats and baskets for sale and partly for the supply of the physical needs of the community. Extreme asceticism was discouraged, although some of the monks followed a very austere diet or might greatly curtail their hours of sleep. There were two meals a day, and flesh and wine were forbidden. Twice a week there were community fasts. Strict obedience to their superiors was required of all, and there were punishments for the disorderly. Chastity and poverty were compulsory. Gossip was forbidden and conversation was supposed to be limited to spiritual subjects. Each monastery had between two and three hundred monks and the total by the time of the death of Pachomius is said to have been three thousand. Mary, the sister of Pachomius, gathered a nunnery about her which was put under the control of the Pachomian superior-general. Soon after the death of Pachomius, two other nunneries were formed. Although they were also in the comprehensive organization, precautions were taken to keep the men and women from meeting.